'Picture Perfect Launch' For Private Rocket Headed To Space Station : The Two-Way A robotic cargo ship owned by SpaceX, a private company, is ferrying supplies to the space station. NASA is turning over routine flights to the commercial sector so that it can focus on other missions. SpaceX's Dragon capsule, atop the company's Falcon 9 rocket, as it blasted off before dawn this morning in Florida. Looking like a bright star streaking up into a black sky, a rocket took off before dawn today from Cape Canaveral Air Force Station in Florida carrying an unmanned capsule filled with food, clothes and other supplies for astronauts on the International Space Station. But this robotic cargo ship doesn't belong to NASA. Instead, it's owned by a company called SpaceX, which made history by launching the first ever private spacecraft on a mission to the station. SpaceX has a $1.6 billion cargo-delivery contract with NASA, which is turning routine flights to the station over to industry so that the veteran space agency can start to focus on more ambitious exploration efforts. After the company's capsule, called Dragon, reached orbit and its solar arrays deployed without a hitch, engineers at SpaceX's launch control room in Florida clapped and hugged each other. Elon Musk, who founded SpaceX in 2002 after making a fortune with the Internet company PayPal, wrote on his Twitter feed: "Feels like a giant weight just came off my back :)"
Musk watched the rocket blast off from his company's mission control in Hawthorne, Calif. "Every bit of adrenalin in my body released at that point," he said later during a post-launch press briefing. "It's obviously an extremely intense moment." This is the third successful flight in a row for the company's Falcon 9 rocket, and the second test flight of a Dragon capsule. In December 2010, a Dragon capsule orbited Earth twice, then splashed down in the Pacific. "Today marks the beginning of a new era in exploration," NASA administrator Charles Bolden told reporters, as he stood next to the big countdown clock at Kennedy Space Center, where many had gathered to watch this morning's launch. "The significance of this day cannot be overstated." "It was just picture perfect, picture perfect launch, everything on the vehicle is working well," Bolden added. "While there's a lot of work ahead to successfully complete this mission, we're certainly off to a good start." Before Dragon can get the go-ahead to approach the station, SpaceX will have to put the capsule through its paces, to show NASA that the spacecraft is under control and there's no possible danger of an accidental collision with the orbiting outpost. For example, Dragon will fly about 1.5 miles below the station on Thursday. And astronauts on the station will run a test of its communications systems by seeing if they can remotely turn on a strobe light. If all goes well, on Friday NASA will give the "go" for Dragon to get as close as 32 feet from the station. Astronauts living there will use the station's robotic arm to capture the capsule. Once it's attached, they will open the hatch and unload the supplies stowed inside. Then they'll fill it with cargo that they want to send home. On May 31, Dragon is scheduled to depart from the station and return to Earth, splashing down in the Pacific, where it will be recovered. SpaceX is planning to modify Dragon so that the capsule could carry a crew of seven in just a few years. The company says it hopes to be flying astronauts in 2015. So far, only spaceships launched by government agencies in the United States, Russia, Japan and the European Union have visited the orbiting outpost. Now that the space shuttles are going to museums, NASA has been relying on the Russian space agency to take American astronauts to orbit. 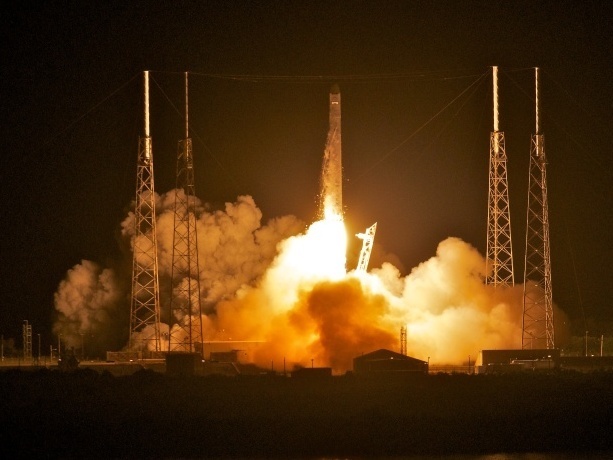 Video of the launch, courtesy of The Associated Press.